Akshobhya is one of the 5 Dhyani Buddhas (wisdom Buddhas), along with Buddha Amitabha, Buddha Vairocana, Buddha Amoghasiddhi and Buddha Ratnasambhava. The Vajra family, to which He belongs, is close linked with the primordial element of water. Akshobhya Buddha signifies the overcoming of passions such as hatred and anger towards other beings. 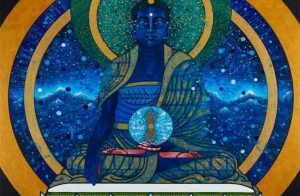 He originates from the seed syllable mantra „Hum” and when he became a complete enlightened Buddha and reached enlightenment state, He was given charge over the eastern paradise Abhirati, which is a state of mind, not actually a physical place. In Sanskrit, this pure land translates in English „to the joyous”, therefore, paradise Abhirati is the land of the joyous. It is considered that those who are reborn in this spiritual realm can never fall back to the three lower realms of consciousness and are never to be born again with a physical body. Hence, it is known that all believers should seek to follow and fulfill the vow of Buddha Akshobhya. Akshobhya’s bija (seed) is Hum and his mantra is Om Akshobhya Hum. He established the enlightened intention that all sentient beings could purify any amount of non-virtue. Even the extreme non-virtue of violence, hatred, and killing can be cleansed through relying on Him as the main focus of meditation, acknowledging and abandoning non-virtuous actions (negative karma), and invoking his healing blessings of purification. In his sutra, the Gautama Buddha Siddhartha Sakyamuni himself extolled the perseverance of Akshobhya in actualizing this healing intention so powerfully that countless Buddha Akshobhya rules over the element of water and embodies the skandha of form. In some traditional systems, He is connected with the skandha of consciousness. His lotus throne is supported by the elephant, which symbolizes strength and steadfastness. Additionally, His symbol is the vajra, which denotes the ultimate state of enlightenment, the indestructible, adamantine nature of pure consciousness, or the essence of Dharma (reality). In some Tibetan Buddhist traditions, the vajra signifies the union of the Buddha and man; one end of the vajra signifies the macro-cosmic realm (the Buddha) and the other end we have the microcosmic realm (man). Namo bhagavate Akshobhaya, tathagatayarhate saṃyaksaṃbuddhyaya. Rochani rochani. Troṭani troṭani. Trāsani trasani. Pratihana pratihana. Sarva karma paraṃparaṇime sarva sattvanancha svaha. In traditional Buddhist tantra, praying to Buddha Akshobhya in profound meditation helps overcome negative emotions, such as – hatred and anger. This mantra is chanted by His Holiness 17th KARMAPA. This entry was posted in Buddhist Mantras on January 30, 2016 by admin.